Located on the eastern side of Glasgow's George Square, the City Chambers were built by a London Scot, William Young (1843 - 1900), and were intended to convey the wealth and importance of Glasgow at the end of the 19th Century. Built in the Italian Renaissance style and opened in 1888 by Queen Victoria, the impressive west facade dominates George Square. Paisley-born Young had won a competition with his design for the building in 1881. Constructed around a courtyard, the corners of the building are capped by domes and an impressive axial tower rises behind the facade. The interior reflects the opulence of Victorian Glasgow with staircases and galleries composed of marble, mosaics and tiles. 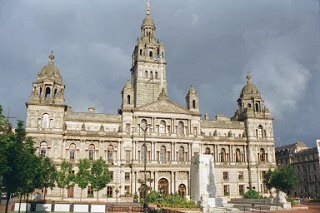 Today, the Chambers remain the principal offices of the Glasgow City Council. The building has served as a location for several films, including The House of Mirth (2000) and The 39 Steps (2008).